Port St. Lucie, Nov. 17, 2012– It’s baseball’s version of the hail Mary, but every once in a long while the hidden ball trick can make a difference – and Saturday, Nov. 17, at Digital Domain Park in Port St. Lucie Florida was one of those times. 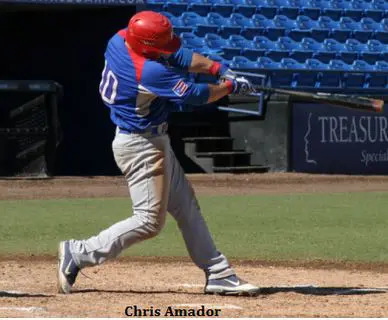 Chris Amador was a relentless 4-for-4 with two RBI, and Gilberto Ramos struck out eight in a complete game effort as the Puerto Rico Lobos defeated Cleveland Steve’s Sports 5-4 to claim the Fall Classic 25 American crown. It was the Lobos’ fifth trip to the finals in the past seven years, but its first Fall Classic title. The game changer, however, may have been a successfully executed hidden ball trick in the seventh inning that took a potential scoring run off of third base. The Lobos never trailed. They pushed across a run in the first inning to jump out to a 1-0 lead. Amador had a leadoff single and scored on a sacrifice fly by Rene Quintana. Ramos worked his way out of a jam in the fifth inning to strand runners at second and third. The Lobos scored a pair of runs in the sixth inning to extend their lead to 3-0. Amador’s two-out RBI double to left to score Edwin Morales. Jose Marichal followed with an RBI single to plate Amador to make it 3-0. Down 3-0 entering the bottom half of the seventh inning, Cleveland put runners on first and third with nobody out – and that’s when third baseman Jetzel Torres pulled off the defensive play of the game. Following a play in which the runner heading to third base was hit by a throw from shortstop, Torres picked up the ball and walked over to calm down his pitcher. As Ramos milled about apparently reflecting on the conversation and his predicament, Torres returned to third base. Unbeknownst to just about everyone, including the third base coach and, most importantly runner Brett Higgins, Torres had the ball. Higgens took a very short, safe, and appeared totally stunned when Torres reached over and tagged him out. Lobos manager Joe Tegron said the hidden ball trick was a play they have practiced but rarely use. All was not lost. Cleveland still scored two runs that inning. Jason Fleming had an RBI fielder’s choice to cut the deficit to 3-1. Krowka delivered a two-out RBI single to left to make it 3-2. Ramos responded with a strikeout of Moyer to strand runners at first and second. Amador struck again in the eighth inning. He crushed a double with two outs to drive in a run. Marichal also ripped a base hit to plate Amador to give the Lobos a 5-2 lead. Steve’s answered and showed some fight by pushing across two runs in the bottom of the eighth. Jeff Tillman drilled an RBI single to score Brian Guzik. John Ramsey smashed a two-out single to bring home Tillman to make it 5-4. Ramos bounced back by retiring Keith Mcleod on a groundout to strand the tying run at second. Ramos retired the side in order in the ninth to preserve the victory for the Lobos. He struck out Moyer to close the game as the Lobos mobbed the pitcher at the mound in a wild celebration. “Gilberto was our MVP and he was our workhorse throughout the tournament,” Negron said. The Lobos avenged an 8-5 loss to the Steve’s Sports during the tournament. Tom Farmer struck out seven in a complete game effort but was saddled with the loss. Higgins finished 3-for-4 and Ramsey also had three hits and drove in a run for the Steve’s Sports. Cleveland Steve’s finished 7-1 in the tournament. It was their first appearance in the finals in their 17-year history. The team’s 45-year-old American division counterpart played and won their finals contest later the same afternoon at Digital Domain.